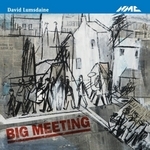 Big meeting / David Lumsdaine. Contents note: Beginnings: "Speak!" -- Gathering, memories: Old Elvet and the racecourse -- The fairground dances -- The miners' hymn -- Crossing Palace Green to the Cathedral -- Undergound: questions -- Praise: people speak -- Coda.